"Advocates of certified registered nurse anesthetists are again pushing the Department of Veterans Affairs to use them more often — and not necessarily under doctor supervision — to improve and streamline anesthesia care at VA hospitals" according to an article published online Dec. 5 at Military.com. AANA President Bruce Weiner, DNP, MSNA, CRNA, and CEO Randall Moore, DNP, MBA, CRNA, were interviewed for the article, titled "Advocates Warn of Backlogs if VA Fails to Certify Nurse Anesthetists." For further information, read the full article, and watch for coverage in future issues of the Anesthesia E-ssential and NewsBulletin. Also, be sure to check AANA Connect for updates on the VA issue. On Nov. 4, 2017 the Center for Medicare & Medicaid Services (CMS) released the CY2018 Final Rule outlining changes to the Merit-based Incentive Payment System under Year 2 of Quality Payment Program. Appropriate anesthesia staffing is important for the efficiency of an anesthesia department, whether it is in a large multi-operating room hospital, an ambulatory surgical center, or an office-based practice. AANA’s new Anesthesia Staffing, Considerations Checklist is available for members at Member Business Resources, under the Policy Considerations section (login required). The U.S. Food and Drug Administration (FDA) has approved Sublocade, the first once-monthly injectable buprenorphine product for the treatment of moderate-to-severe opioid use disorder (OUD) in adult patients who have initiated treatment with a transmucosal (absorbed through mucus membrane) buprenorphine-containing product. It is indicated for patients that have been on a stable dose of buprenorphine treatment for a minimum of seven days. Learn more at FDA.gov Additionally, visit AANA’s opioid resources at Opioid Crisis. Whether you need a receipt for reimbursement or tax purposes, it’s all in MyAANA. Print or download your receipts, anytime and anywhere. You’ll see all of your AANA orders – from membership to meetings. You can filter by category and/or year. Then just select the blue “Receipt” button to download or print your receipt. Please note: The AANA office will be closed from Dec. 25-Jan 1. If you need assistance, please contact us as soon as possible. 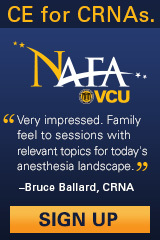 Review strategies for a non-narcotic, multi-modal surgical platform in Putting Control into the Hands of the CRNA: Ultrasound Infiltration Techniques & Opioid Sparing Strategies, a new sponsored course free to AANA members. Topics include the opioid epidemic; challenges in managing postsurgical pain; and ultrasound-guided field techniques of the abdominis, breast, and knee. The course includes a 5-minute 2-D cadaver simulation of the ultrasound-guided technique. Visit AANA Learn Member Exclusives, and be sure to log in before taking the course. Supported by an educational grant from Pacira. If you’re a CRNA who works at a critical access hospital or in a rural setting, there’s an AANA Connect community for you. Join the Critical Access Hospital/Rural Community to network with your colleagues and discuss issues related to your practice. Visit AANA Connect and click on “Communities,” then “All Communities,” and select “Critical Access Hospital/Rural Community.” This community is open to all members. The AANA Education Committee is seeking candidates interested in serving on the committee as a delegate. The deadline for receiving completed candidate packets is Jan. 15, 2018. The election will be held, and the winner announced, at the Assembly of School Faculty in February 2018. The candidate information packet is available on the AANA website. Registration is now open for the only forum that brings all nurse anesthesia educational programs together in one place to discuss and define the future of the profession. If you are passionate about nurse anesthesia education, the Assembly of School Faculty is the must-attend meeting of the year. Find out more, and register now! Registration for the AANA Mid-Year Assembly is Now Open! Are you a CRNA or SRNA with a strong interest in furthering the nurse anesthesia profession through federal political advocacy? If so, we invite you to apply for a position on the CRNA-PAC Committee beginning in fiscal year 2019. Responsibilities of Committee members include setting and overseeing the CRNA-PAC expenditure and income policy, determining funding of open-seat and challenger candidates, fulfilling duties at CRNA-PAC events and AANA national meetings, participating in fundraising activities, and attending in-person meetings at the Mid-Year Assembly and Joint Committee Conference. A full job description can be found here. Interested candidates should submit an application to the AANA Executive Unit at committees@aana.com by Jan. 31, 2018. Student applicants should submit a letter of permission from their program director along with their application. Additional criteria for student applicants can be found at CRNA PAC. If you have any questions, please contact Catharine Harris, AANA Associate Director of Political Affairs, at charris@aanadc.com or (202) 741-9087. The following is an FEC required legal notification for CRNA-PAC: Gifts to political action committees are not tax deductible. Contributions to CRNA-PAC are for political purposes. All contributions to CRNA-PAC are voluntary. You may refuse to contribute more or less than the guidelines suggest and the association will not favor or disadvantage you by reason of the amount contributed or the decision not to contribute. Federal law requires CRNA-PAC to use our best efforts to collect and report the name, mailing address, occupation, and the name of the employer of individuals whose contributions exceed $200 in a calendar year. All contributors must be US citizens. Visit www.crnacareers.com to view or place job postings. New evidence indicates that rescue events and/or death are less likely during gastrointestinal endoscopic procedures (GEP) under sedation when capnography monitoring is used. Sedation during colonoscopies and other GEP provides patient comfort but can trigger airway obstruction, respiratory depression, and hypoxemia. A retrospective study finds, however, that tracking respiratory rate, end-tidal carbon dioxide levels, and waveform pattern via capnography allows providers to keep real-time tabs on ventilation. Armed with data from 258,262 inpatients and 3.8 million outpatients, researchers compared outcomes based on whether they were subjected to pulse oximetry (SpO2), capnography, SpO2 with capnography, or neither SpO2 nor capnography. The results revealed that capnography cut the likelihood of death at discharge about 47 percent for inpatients and 82 percent for outpatients. The odds of a pharmacological rescue event at discharge, meanwhile, was reduced 10 percent and 61 percent, respectively. The findings appear in BMC Anesthesiology. From "Capnography Sensors Reduce Adverse Outcomes During Sedation"
A new study has revealed that anesthetics, in use for more than a century but still largely a mystery, impact plants much in the same way that they affect humans and animals. Upon exposure to anesthetic agents, investigators have discovered, plants like venus flytraps and growing pea tendrils lose autonomous movement as well as touch-induced movement. The finding that anesthetic action at the cellular and organ levels may be similar in plants and animals, as reported in the Annals of Botany, has big implications for future research. Plants could eventually serve as model objects to explore general questions related to anesthetics, and they could even become a viable alternative test system for human anesthesia. From "Anesthetics Have the Same Effects on Plants as They Have on Animals and Humans"
An analysis of operating-room emissions in three countries suggests that a facility's choice of anesthetic gases during surgery affects its impact on the environment. The groundbreaking research focused on a single surgical suite in the United States, one in Canada, and another in the United Kingdom. Researchers estimated that anesthetic gases produced roughly 2,000 tons of carbon output at each of the North American locations, accounting for 51 percent of total surgical emissions in Minnesota and 63 percent in Vancouver. The Oxford operating theatre, by comparison, generated only about 200 tons—which made up just 4 percent of total surgical emissions there. The disparity, according to investigators, is tied to greater utilization in North America of desflurane, which is much more damaging to the environment than isoflurane or sevoflurane. Because desflurane is also expensive, curtailing its use promises to be beneficial from both an ecological and a fiscal standpoint. "Our study shows that it's possible to reduce the carbon footprint of surgery, which also reduces costs, without compromising patient care," remarked lead study author Andrea MacNeill, MD, of Vancouver General Hospital. For U.K. facilities, where energy consumption is the main culprit behind emissions, researchers say reducing heating, ventilation, and air conditioning at night and on weekends could shrink the carbon footprint. From "First Study to Measure the Carbon Footprint of Surgery Suggests Where Emissions Reductions Are Possible"
PLOS One recently ran a study that linked commonly used analgesics to an elevated risk of obesity and high blood pressure in addition to their well-documented associations with addiction, accidental overdose, sedation, and breathing problems. Some of the main culprits include opioids, pregabalin, gabapentin, amitriptyline, and duloxetine—which sometimes are coupled with cardiometabolic (CM) drugs to treat chronic pain. In a study of more than 130,000 patients taking CM drugs either alone or with an analgesic, U.K. researchers calculated a 95 percent higher risk of becoming obese among patients who were prescribed both CM agents and opiates. These individuals also were 82 percent more likely to have a "very high-risk" waist circumference and 63 percent more likely to develop hypertension. The effect was maintained even after accounting for lifestyle variables. "Sedation might decrease physical activity and therefore reduce energy expenditure," the authors offered as one explanation for the results. "Opioids have also been shown to alter taste perception with a craving for sugar and sweet foods described." Based on the findings, the investigators believe analgesics should be prescribed for shorter durations and additional safety studies should be conducted. From "Commonly Prescribed Painkillers Raise Risk of Obesity, Hypertension"
An Egyptian study evaluated the analgesic efficacy of duloxetine plus etoricoxib—administered as part of a multimodal pain regimen—on pain and opioid consumption following lumbar spine surgery. The 120 adult enrollees were evenly randomized to receive only etoricoxib, a nonsteroidal anti-inflammatory drug; only duloxetine, an antidepressant with analgesic properties; a combination of etoricoxib and duloxetine; or placebo. Patients took the medications one hour prior to laminectomy and again after 24 hours. While both duloxetine and etoricoxib delivered significantly more pain relief at rest than placebo, neither had an independent effect on pain with movement. Together, however, the two agents achieved a marked reduction in pain scores over the entire postoperative period—both at rest and on movement—as well as a substantial decrease in morphine requirement at 24 hours compared with the other treatment arms. The most common adverse effects that participants experienced were nausea and vomiting, which occurred less frequently with duloxetine plus etoricoxib than with placebo. Based on the findings, the investigators from El-Minia University recommend a short-term course of etoricoxib and duloxetine as an adjuvant to opioids after spine surgery. The result, they conclude, will be to alleviate postoperative pain while avoiding major side effects. From "Perioperative Duloxetine and Etoricoxib to Improve Postoperative Pain After Lumbar Laminectomy"
While supraclavicular and infraclavicular brachial plexus blocks are both considered effective regional anesthesia options for elbow surgery, researchers investigated how the techniques measure up under direct comparison. Led by Brigid Brown, MD, a clinical fellow in anesthesia at Canada's Western University, the team randomized 150 study participants to one type of block or the other. They found the supraclavicular and the infraclavicular approaches to be similarly effective, with conversion to general anesthesia required after block failure in 5.3 percent of the former cases and 4.0 percent of the latter. Onset of motor block also was comparable, at 307 seconds on average for supraclavicular and 284 seconds for infraclavicular—although total motor block onset and total sensory block onset were both achieved more quickly with supraclavicular block. Secondary outcomes, including postoperative pain and patient satisfaction, also were similar between the two sets of patients. The one exception involved paresthesia during block insertion, which affected 17 patients undergoing supraclavicular block but only six undergoing infraclavicular block. Ki Jinn Chin, MD, who helped moderate Brown's presentation at the Canadian Anesthesiologists' Society 2017 annual meeting, cited adverse effects like phrenic nerve palsy and Horner syndrome as personal reasons for shunning supraclavicular blocks. Brown and her colleagues, however, did not study this aspect during their trial. From "Supra- and Infraclavicular Brachial Plexus Blocks Equal for Elbow Surgery"